The following certification standards have been adopted by Conifer Canine. Each test is designed to determine the proficiency of the Police/Security Dog team for certification in each phase of police/security work for K-9’s. 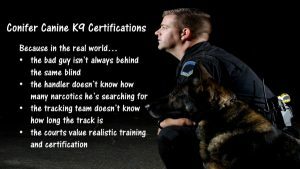 It is highly recommended, that a Police/Security Dog team graduating from a training school be tested and certified. The successful passing of and certification of these courses is acceptable testimony in court. Each test is based on a pass/fail basis. Any team failing a certification test will be allowed one re-test on certification day. Subsequent testing will occur after a minimum seven-day period for remedial training. The Training Director determines if the team will be certified upon completion of the test. If certified, the handler and dog are considered a team and it is the team that is certified. In the event the dog changes handlers, a new team will then exist, which will immediately invalidate the previous certification. The new team will then need to be certified. The team fails if/when the dog is out of control of the handler at any time during any phase. I. Certifying Authority The Training Director or his/her appointee will act as the certifying authority for all Conifer Canine certification testing. Teams successfully completing certification testing in a specific phase will be issued a certification certificate and will be valid for a period of one (1) year from the date of issue. II. Equipment Prong/pinch collars and electronic collars may be worn by the K-9 during testing; however, collars of this style may not be activated during any certification phase. III. Certification Validity Conifer Canine’s certifications issued to a regular member Police/Security Dog team are VALID ONLY when the team is being utilized by: the law enforcement agency the Police/Security Dog team is employed by, a law enforcement agency in which the team is on official assignment to by authority of the law enforcement agency for which the team is employed. (i.e., county, state, federal task force), a law enforcement agency requesting and receiving official mutual aid from the team’s law enforcement agency employer, and/or a security dog team employed by security provider, and/or a duly authorized HRD team and/or SAR team. DISCLAIMERS: A Conifer Canine certification will be valid when the Dog team is being utilized for law enforcement agency uses or security provider use. Obedience Certification Test This test is to determine the handler/dog’s ability and proficiency in performing off lead obedience exercises and the handlers’ total control of his/her dog. Passing this test is a prerequisite before proceeding to any other certification phase in which the dog will be utilized off lead. The handler/dog team may be tested in the following three phases: Heeling Phase, Walking Phase, and the Distance Phase. Each phase may be tested in any sequence and will be judged on a pass/fail basis. No cruel or abusive corrections will be displayed by the handler at any time. Such activity will be means of disqualification, with possible re-examination. The team fails if/when the dog is out of control of the handler at any time during any phase. Heeling Phase This phase will consist of the following exercises: Normal pace, Fast pace, or at the double-time Slow pace, or at the half-step. Each leg of the above must be a minimum of ten feet long. The different phases may be conducted on any leg. On one leg of the course, the team must heel through a group of, at least three stationary people. Walking Phase The handler and dog will start from the “Heel” position and walk forward together. At a point designated by the Training Director, the handler, without breaking stride, will place his/her dog in a “Stay” position (sit or down), and continue walking. At a point designated by the Training Director, the handler, while continuing to walk away from his/her dog, next commanding his/her dog to “Heel.” The Training Director will instruct the team to “About Turn” and then to walk forward. At a point designated by the Training Director, the handler without breaking stride, will “Stay” his/her dog, (sit or down), and continue walking. At a point designated by the Training Director, the handler will turn and retrieve his/her dog and return to the original starting point. Distance Phase At a point designated by the Training Director, the handler will leave his/her dog in a “Stay,” at a distance of no less than twenty-five feet. The handler will then be directed to turn and face his/her dog. The Training Director will then advise the handler to complete the following commands. “Sit & Down” (by voice) and/or “Sit & Down” (by hand signal). Note: Choice and order of commands or signals will be at the discretion of the Training Director. The Training Director will then advise the handler to recall his/her dog by hand signal or by voice command. At a point prior to the dog reaching the handler, the Training Director will advise the handler to “Stop” his/her dog by voice or by hand signal. Stopping the dog may be by either a “Down, Sit or Stay” command. After the dog has stopped, the Training Director will advise the handler to recall his/her dog to the heel position by hand signal or voice command. Aggression Control Certification Test This certification test is to determine a dog team’s capabilities, in the performance of specific exercises, while under simulated, realistic conditions which the team may encounter during their official duties. This test is designed to test the dog’s ability, proficiency, courage, and the handler’s total control of his/her dog. Protective equipment in good condition will be worn by the suspect during each phase of the aggression control test. The type of lead used by the handler will be at his/her discretion, but will not be more than six feet in length. Each phase will be completed off lead unless otherwise specified. The gunfire phase of the test will use a variety caliber of handguns and blank ammunition only. All weapons and ammunition will be safety checked by the certifying Training Director prior to the gunfire phase of the test. Whenever possible, the suspect will be unknown to the dog. Those acting as suspects for the test may include handlers being tested, trainers, or other individuals approved by the Training Director, or the Training Director himself. In the phases requiring the dog to physically apprehend the suspect, the dog must fully engage and hold the suspect. Failure to engage is grounds for failure. In the phases requiring the dog to stop his pursuit and apprehension of the suspect, the handler may use any command or series of commands to control his/her dog. The handler will inform the Training Director prior to testing as to the command sequence used. Failure of the dog to release and/or to respond to obedience commands in a timely manner is grounds for failure. The team will be tested in the following four phases. Each phase is tested on a pass/fail basis and must be passed before proceeding to the next phase. The team fails if/when the dog is out of control of the handler at any time during any phase. Phase One: False Start The handler will place his/her dog in the heel, sit, or down stay position. The suspect will then approach the front of the team and close to a distance of ten feet from the team. The suspect may or may not engage in conversation with the team. The suspect will then walk or run away in the opposite direction of the team. The handler will command his/her dog to stay prior to the suspect leaving the teams vicinity. During this phase the dog must remain in the commanded heel position as the suspect leaves the area. Phase Two: Recall The dog will start this phase from the heel position. The suspect will be at a distance of approximately forty yards away from the team. The Training Director will direct the suspect to run from the team in any direction. The Training Director will direct the handler to send his/her dog to make the apprehension. The suspect will stop and surrender, terminating the pursuit when instructed by the Training Director. The handler will call off the dog. The type of call off is at the discretion of the handler. The Training Director must be advised of the type of call off prior to the test. Call-offs may include the following: The dog is recalled to the heel position. The dog will be commanded to a down, sit or standing position, and the handler will join the dog. The dog will be commanded to a down, sit or standing position, and the handler will recall the dog. The importance of this phase is that the suspect is not bitten or “mouthed” by the dog on the call off. Active non-aggressive contact made by the dog during the call off is not a failure. This phase is completed upon the dogs’ return to the heel position with the handler. Phase Three: Handler Protection This phase simulates a suspect being taken into physical custody by the handler. The handler commands the dog into a sit, down, or stay position at a distance of twenty feet from the suspect. The handler will approach and pat down the suspect. The suspect will simulate an attack upon the handler during the pat down/simulated handcuffing. The dog will apprehend and hold the suspect without command from the handler. The dog will be called off in any of the three methods as described in phase two. The dog is then placed back into the sit, down, or stay position. The handler will pat down the suspect a second time with no attack being initiated by the suspect. The dog will remain in the sit, down, or stay position. The Training Director will advise the handler to back away from the suspect and call his/her dog to the heel position. The phase is completed when the dog returns to the heel position with the handler. Phase Three may include a variety of scenarios involving a vehicle stop with a foot pursuit, building search, or any attack upon the handler by the suspect. Phase Four: Short Chase With Gunfire The suspect will be approximately forty yards distance away from the K9 team. The suspect will be armed with a handgun with blanks. The suspect will run away from the team and fire shots in a direction away from the dog. The handler will release the dog after the shots and apprehend the suspect. The suspect will be ordered by the handler to drop the gun if still in his possession. The dog will be called off in any of the three methods as described in phase two. The phase is completed when the dog returns to the heel position with the handler. Note: Handlers with dogs trained to ignore gunfire will notify the Training Director prior to this test phase. Phase Four may include a variety of scenarios involving a vehicle stop with a foot pursuit, building search, or any attack upon the handler by the suspect. Area Search Certification Test This test is to determine the Police/Security Dog’s ability and proficiency in searching for a hidden suspect within a large area where a known track is not available. The Training Director will determine the general area to be searched and the search time allocated for the test. During the test, the Training Director will observe the working team from a distance that minimizes distractions and/or interference for the team during the search. The Handler will begin the test from a starting point he/she has selected, using downwind conditions (if present), located outside of the search area perimeters. The handler may conduct this test on or off lead. Standard leads, collars, correction collars, or harnesses may be used. The handler will advise the Training Director to an area within ten feet of the hidden suspect. The handler will command the hidden suspect to make themselves physically or verbally known to the team. The Suspect should be unknown to the dog, who is not normally used in the dog’s training. The suspect will conceal themselves from the team, within the search area perimeters ten (10) minutes prior to the start of the test. The team fails if/when the dog is out of control of the handler at any time during any phase. Building Search Certification Test This test is a simulation of a working building deployment. Three types of building structures are authorized for use in this test. The Training Director will accompany the team during the test, in which his presence will represent a backup officer during an actual search. Please note: Officer survival using cover and concealment tactics during the test will be also evaluated. The team fails if/when the dog is out of control of the handler at any time during any phase. Building Structure Types: Residences. Dwellings Warehouses, Stores, Barns, Open areas within a building, School, hotels, office buildings, multi-room interior. Any building judged acceptable by the Training Director. The team fails if/when the dog is out of control of the handler at any time during any phase. Suspect: Will be hidden at least ten minutes prior to the start of the test. Will conceal themselves in a location not visible to the K9 team. Will wear protective equipment if necessary for protection. Should enter the building structure by a different entry route, than to be used by the K9 team. Will be concealed at any height or depth. Training Director: Will designate the area of the building to be used for the test. Will designate the area for the team to start their search. Will accompany the team into the building to observe the test. During the test, the Training Director will observe the working team from a distance that minimizes distractions and/or interference for the team during the search. A Training Director, who determines a dog not to be searching for the suspect will fail the team. Handler: This test may be conducted on or off lead. Standard equipment may be used such as collars, harnesses, etc. The handler may encourage his/her dog with commands and/or praise as needed during the test. Under no conditions will the handler open any doors that are closed in his/her search area. The dogs’ indication in locating the suspect must be obvious to the Training Director. The handler will advise the Training Director of their observations, when his/her dog indicates the presence of a suspect behind a closed door. Article Search Certification Test This test is to determine the Police/Security Dog’s ability and proficiency in searching a designated area for articles having human scent on them. The test represents a search for discarded evidence or lost items. The Training Director will designate the search area for the test. The Training Director will observe the test from outside of the search area. The Search Area size for testing purposes will be at the Training Director’s discretion. Ground surface will be covered by heavy vegetation less than ten inches high. One or more persons will contaminate the test area by traversing through the area twice with a dog prior to the test. Three Search Articles of different composition will be selected by the Training Director. Articles may consist of metal, wood, paper, plastic etc…and will be thrown at random into the search area. One of the three articles used for testing must be of metal composition. Articles to be used will be selected from, but not limited to, the following list: Plastic credit card, Plastic/Metal cigarette lighter, Shotgun shell, Nylon/Leather Wallet, Metal handgun, Crumpled cigarette pack, Wood handle tools, Paper match book, Keys, Sunglasses. The Handler may conduct this test on or off lead at his/her discretion. The test will begin when the handler and dog enter the search area. The team will have approximately five minutes to search and locate the three articles being tested. The dog must locate two of the three articles with strong indications on both articles to pass this test. The dog will be judged on the alert and indication to the search article. This must be obvious to the Training Director. After each indication and article recovery, the handler will command the dog to continue to search for the remaining article(s). For testing purposes, it is preferred that the handler will elect to recover the article(s) him/herself, which were located by the dog. Failure of this test may be based on the lack of handler control, disinterest on the part of the dog, biting of the Training Director or other non-aggressive personnel assisting in this test. Trailing Certification Test The terms tracking and trailing can be used interchangeably. Purpose of the Evaluation: The test will consist of two areas of evaluation. 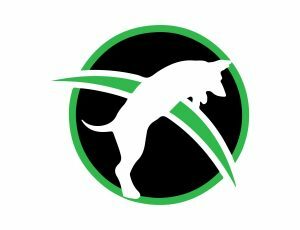 The first area is to determine the proficiency and reliability of the K9 in tracking and to test the dog’s ability to be human-scent discriminate. The second area of evaluation is to test the handler’s ability to read the dog, implement lost track recovery procedures, and provide communication as to the direction and progress of the track. The team fails if/when the dog is out of control of the handler at any time during any phase. Certification Testing: The testing for the K9 team will be on a pass/fail basis. Any team failing a certification test will be allowed one re-test on certification day. Subsequent re-testing will occur after a minimum seven-day period for remedial training. K9 Equipment used during Certification: During testing exercises, only equipment normally used by the K9 team will be allowed, and shall consist of collar, leash, and tracking harness. Testing Procedure: Prior to testing, instructions will be given to the K9 team by the training director as to the testing requirements. Exercise time limits will be at the discretion of the training director. Trailing Test Requirements: 1. The tracking exercise will be conducted with harness and lead. 2. The handler may use multiple commands and/or praise throughout the exercise. 3. The track will be a minimum of one-half hour old and maximum of two hours old when started by the K9 team. Track age will be determined by the training director based on environmental conditions. 4. The track will be a minimum of one half mile in length. 5. The track will cross multiple surfaces and must include grass, and at least one of four factors – asphalt, concrete, gravel, or dirt – and a wooded area. 6. The track will have two cross tracks, made by different people, that are fresher than the original track. 7. A scent article may be requested by the handler prior to beginning the track. At least two other tracks will be located in the starting area. The general area of the starting point of the track will be provided to the handler, but no direction will be given. The K9 must locate the correct track and begin tracking from the general area previously indicated. 8. The training director will either accompany the team during the track or visually follow the team. Any team that wanders too far off the track, at the training director’s discretion, will fail the exercise. 9. The tracklayer will be in an upwind position at the end of the track. The handler must recognize air-scenting indications by the K9 of the tracklayer’s position and announce those to the training director as soon as indications are given. Upon locating and identifying the tracklayer’s positions, the exercise will be concluded. Narcotic Detector Certification Test This test is to determine the proficiency and reliability of Police/Security Dogs in the detection of narcotics. Teams will be tested in a minimum of three (3) test phase areas which are as follows: Vehicle Phase (Required) Building Phase (Required) Container Phase (Optional per Training Director’s discretion) Other Designated Areas (Optional per Training Director’s discretion) Note: There will be a mandatory break between each test phase. Certification testing will utilize at least three controlled substances. Certification testing substances may include: marijuana, cocaine, crack cocaine, heroin, methamphetamine, and/or others. The narcotic substance will be used in certification testing as per availability. Pseudo narcotics are not permitted for narcotic detector certification testing. Narcotic Detector Test A minimum of one hide of each odor attempted to be certified in will be hidden in one of the three phases by the certifying Training Director. All certification testing phases will consist of four search venues. Odors attempted to be certified in will have a minimum set time of twenty minutes prior to beginning the test. Narcotics hides will be unknown to the team and may be placed high or low. Narcotics amounts to be used in the test will be determined by the certifying Training Director. A minimum of one gram of each odor will be used in testing. The narcotic detector certification test will be conducted on a pass/fail basis. Only one overall false / negative alert will be permitted to pass the certification test. A team negative alert is defined as any incorrect response by the handler or canine. The team fails if/when the dog is out of control of the handler at any time during any phase. Vehicle Phase Testing: The search area will consist of up to four vehicles. The vehicles will be spaced in manner that cross contamination will not occur. Up to two vehicles will contain hides. The remainder will be blank. Narcotics hides may be placed either interior or exterior per the Training Director’s discretion. Building Phase Testing: The search area will be at the Training Directior’s discretion and must contain rooms with hides and romms that are blank. Container Phase Testing: The search area will consist of at least one row of four containers. The container items will be spaced in such a manner that cross contamination will not occur. One hide will be placed in one of the four containers. The remaining containers will be blank. Time limits during each search phase are per discretion of the certifying Training Director and so long as the Training Director determines that the team is working. The Certifying Training Director conducting the test will be responsible for ensuring all test phase areas are safe for the certifying team(s). Certifying Training Director will take every precaution in securing and concealing narcotics aides in an effort to prevent accidental exposure and ingestion of narcotics substances used for testing purposes. Searches may be conducted on and/or off lead at the handler’s discretion. Searches may be conducted by “free search” and/or “detailed search” at the handler’s discretion. The dogs reward toy or object used during the narcotic detector certification test will not contain any narcotics or narcotic odor/residue. Training Directors certifying the narcotic detector team(s) will issue the certification certificate listing the narcotics odors certified by their “laboratory” names. Explosives Search Certification The term “Aid” shall mean an explosive substance. This test is designed to test the reliability of dogs in the detection of explosives. It is a two part testing process: It will consist of Odor Identification testing and Operational Search testing. Both portions must be passed in order to be a certified explosives detection team. For either portion of the test, the Team is not allowed to miss any training aids. Testing is on a pass/fail basis and all final decisions rest with the Training Director conducting the testing. If a team fails in one test area, the Training Director has the discretion to either retest only the area missed or the entire testing process at a later time. The odor testing section must be passed before any search testing can be attempted. The testing can be done over a one day period or more. This decision shall rest with the Training Director. It is recommended however that all testing be completed on the same day. All aids will be placed at least thirty minutes prior to testing. No detonating devices will be used as aids in testing. If an aid has to be moved to a new location, the previously used area can be removed as a testing sight. This decision is at the Training Director discretion. Prior to the first detection team entering the test area, a man and a K9 may be walked through the testing area. This is at the Training Director’s discretion. Each handler must tell the Training Director how his/her dog will alert to an aid prior to testing. Each indication to an aid by the canine must be obvious to the Training Director. Any dog who scratches or shows any aggression toward an aid is an immediate failure. All aids used in testing should be of recent manufacture and stored in separate containers. It shall be the responsibility of the agency being tested to provide the testing aids. Strict safety measures shall be upheld during testing. No smoking will be allowed in any testing areas. All teams must be tested on all basic odors. The basic odors are: Powders (Black or Smokeless) Commercial Dynamites C4 or Flex-X Data Sheet (RDX) TNT or Military Dynamite Primer Cord (PETN) Slurries (Water-Gel) The maximum weight of the explosive used shall be unlimited; however, a minimum weight of a half pound or one stick shall be used for testing. The handler will not be told the number or type of explosives they are searching for prior to any testing. The team fails if/when the dog is out of control of the handler at any time during any phase. Explosive Odor Identification Testing This testing provides for basic odor identification of explosive odors to ensure the team’s ability to indication on their presence. The testing process shall be a series of rows of cinder blocks with glass jars inside each, or clean paint cans. These items shall be placed in rows spaced equally apart to allow easy access by the teams to effectively check each. All jars or cans shall be clean and due care shall be used to ensure no cross contamination of odors or contamination with human odors when placing and handling aids, jars or cans. Indication must be obvious in nature and the handler must notify the Training Director of each indication. The handler may not point out hides or guide their dog to indicate on a hide. Any urinating, defecating, or aggression shown towards training aids will be immediate failure. Retesting is at the discretion of the Training Director, however no more than two attempts are allowed in the same day to pass this testing. All aids will be placed at least thirty minutes prior to testing. The basic odors to be used are: Powders (Black or Smokeless) Commercial Dynamites C4 or Flex-X Data Sheet (RDX) TNT or Military Dynamite Primer Cord (PETN) Slurries (Water-Gel) The maximum weight of the explosive used shall be unlimited; however, a minimum weight of a half pound or half stick shall be used for testing. The number of hides shall be unknown the handler. Building Search: The building search will consist of a minimum of a number of rooms at the Training Director’s discretion. Each room should be realistic in setting. Only one explosive aid may be placed in each room. At least one room should contain no aid. The aids will be placed so the canine cannot retrieve it. The handler may not open cabinet doors, desk drawers, closet doors, etc. Building Exterior Search: The exterior of any reasonable sized building may be used as a testing area. These may include buildings such as houses, office buildings, schools, warehouses etc. Hide location will be at the Training Director’s discretion, but common sense must prevail on locations used. Aircraft Search: This will be at the discretion of the Training Director. Availability will be the ruling factor in the testing. The entire search shall include the interior and exterior of the aircraft along with all ground support equipment. One aid may be placed inside of the aircraft. Additional aids may be placed outside at the discretion of the Training Director. This can be either inside the aircraft or outside. All aids will be placed so the canine cannot retrieve them. Contamination rules will be strictly adhered to regarding the placement of aids inside any aircraft. Baggage Search: Baggage shall be defined as hard and soft-shell suitcases, attaché case, clothing bags, brief cases, golf bags, sea bags, duffel bags, etc… The number of bags used shall be at the Training Director’s discretion. (Bags may contain some clothing or other materials). All aids will be placed inside the bags so the canine cannot retrieve it. Bags may be placed in rows with enough space between each bag to allow the canine to search. Mass Transit Vehicles: The Training Director will select the mass transit vehicles, based on availability. Consideration may be given to the types of mass transit vehicles typically encountered by the handlers. These vehicles may include buses, trains, watercraft and etc. Training aids will be placed so that the canines cannot retrieve them. The Training Director will determine the number and placement of aids and blank areas. Locker Searches: Lockers may also be used as a testing area. Hides may be in the lower portion or the upper portion of a locker. The number of hides shall be at the Training Director’s discretion. Open Area Search: Open area to be no smaller than 50 X 50 yards. Aids will be placed at the discretion of the Training Director and may be placed anywhere from below the surface level to a maximum of 12 feet above surface level. An open area may be: Open Fields, Wooded Area, or any area outside not covered. This test is to determine the proficiency and reliability of Police/Security Dogs in the detection of human remains. Teams will be tested in four phase areas which are as follows: Vehicle Phase, Building Phase, Buried Land Search, other Designated Areas: rubble, water, disarticulated remains Note: There will be a mandatory break between each test phase. Human remains consisting of blood material, tissue, and bone will be utilized for testing. The team fails if/when the dog is out of control of the handler at any time during any phase. Cadaver Detector Test – Vehicles: At least three vehicles free from any target odors of narcotics or explosives will be utilized for testing. One hide will be placed on the interior or exterior of a vehicle per the Training Director’s discretion at least 30 minutes prior to the beginning of the test. The team will search all vehicles. The team must locate the vehicle containing the cadaver hide. Training Director’s Choice: Rubble, Disarticulated Remains, or Water: The Training Director will choose the venue for this test. Rubble will consist of manmade debris. An unknown (to the handler) number of hides will be placed in the rubble pile. The team must locate all hides. Disarticulated remains will consist of multiple hides of bone placed in an area sized according the discretion of the Training Director. These bones will not be visible to the handler. The team must locate the bone field. General Guidelines: Cadaver amounts to be used in the test will be determined by the certifying Training Director. A minimum of 1.5cc liquid or 15 grams solid weight will be utilized. The cadaver detector certification test will be conducted on a pass/fail basis. Cadaver hides in the vehicle phase may be either on the interior or exterior of the vehicles per the Training Director’s discretion. Time limits during each search phase are per discretion of the certifying Training Director and so long as the Training Director determines that the team is working. The Certifying Training Director(s) conducting the test will be responsible for ensuring all test phase areas are safe for the certifying team(s). Certifying Training Director(s) will take every precaution in securing and concealing cadaver hides in an effort to prevent accidental exposure and ingestion of cadaver materials used for testing purposes. Searches may be conducted on and/or off lead at the handlers’ discretion. Searches may be conducted by “free search” and/or “detailed search” at the handlers’ discretion. The dogs reward toy or object used during the cadaver detector certification test will not contain any cadaver odor/residue. The test will be conducted on a pass/fail basis. The Training Director determines if the team will be certified upon completion of the test. If certified, the handler and dog are considered a team and it is the team that is certified. In the event the dog changes handlers, the previous certification is invalid and the new team will have to be tested in order to be certified.